Bringing your designs to life. We have the Engineering to design and manufacture the quality electronic solution you expect. We have two RoHS compliant wave solder machines currently running in our facility. The first is a SEHO Power Wave 8440 which is ideally suited for the processing of lead-free solder alloys. It provides the highest lead-free soldering quality due to modern solder nozzle geometries and a flexible preheat area. The second machine is a state-of-the-art Vitronics Soltec Delta 5, set up to process more challenging high density/high terhmal mass RoHS assemblies. Altek currently has two wave solder machines to support the Tin-Lead process. 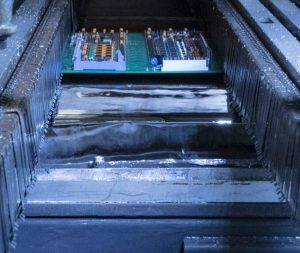 As there is still a need for tin-lead soldering in the industry, we maintain an Electrovert Vectra Elite and an Electrovert Econo Pak+ to process the most challenging tin-lead assemblies.